"National Refrigeration", established in the year 2009, has emerged as a prominent and dependable company engaged in offering excellent installation services of different cold storage units. All these cold storage units are sourced from Blue Star assuring optimum functioning and cost benefit solutions. It includes Cold Storage Rooms, Cold Storage For Frozen Item, Cold Room, Cold Storage For Apple, Freezer Room, Cold Storage Room For Fruits, Chiller Room, Cold Room, Cold Rooms For Restaurants, Cold Rooms For Convenience Store, Cold Rooms For Hospitals, Cold Rooms For Dairy, Cold Rooms For Flori-Culture Segment, Cold Room Units, Ripening Chambers, Fruit Ripening Chambers, Ripening Chambers, Banana Ripening Chambers, Mango Ripening Chambers, Refrigeration Units, Condensing Units. These are installed by our skilled technicians whilst adhering to the industry standards. We have in-depth expertise in offering installation services for the following. Installation and allied after-sales-services for these cold storage units are carried out with the help of a team of our skilled technicians and quality controllers. 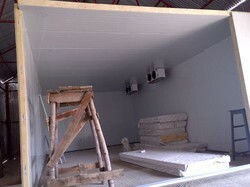 They properly check the clients' site before installation of these cold storage units. Proper floor planning before the installation allows assuring effective functioning of these cold storage units. It is an irony that though India is the largest producer of fruits and second largest producer of vegetables in the globe, the per capita availability of fruits and vegetables is low as compared to the global standards due to the post harvest losses and deterioration of the fruits & vegetables till they reach to the consumer, all resulting in high marketing costs, market gluts, price fluctuations and allied problems. However, these problems can be solved with the help of advanced cold storage units for storing large amount of fruits, vegetables, agricultural products and processed foods for a longer time period. Under the able guidance of our mentor 'Mr. Sharique Khan' we have been flourishing with our immense growth. His business wisdom and excellent HR management skills are some other factors behind our success in this domain. We are following quality centric approaches right from our inception and ensure that installation services offered to clients are in compliance with the industry norms. Our quality controllers and technicians work in close association with each other during the installation process. They first check the site and accordingly make the floor plan for installation. We have been able to attain immense success and growth throughout these years due to the meticulous and industrious efforts of our skilled professionals. These professionals are employed in our team after we assess them on their skill sets, industry experience and ability to handle bulk workload. The procuring agents ensure to source only best in class cold storage units in order to meet the exact demands of clients. 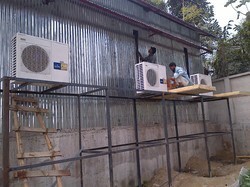 Further, the technicians in our team ensure proper installation of these cold storage units. With customer focusing approach, we have been able to build a vast customer base across the country. This is further apparent from the fact that we have installed cold storage units for clients based across the domestic markets. Our professionals ensure that the installation of these cold storage units are carried out as per the international quality standards while adhering to clients' demands. Timely completion of installation and competitive prices make us the favored partner of clients when it comes to cold storage units. With our customer focusing approach, we have been able to build a vast customer base across the country. This zeal is further apparent from the fact that we have installed cold storage units for clients based across the domestic and global markets.